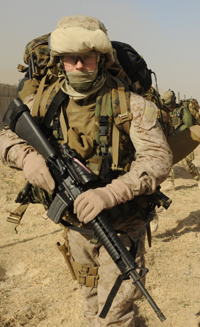 The United States Marine Corps (USMC) is a branch of the US Armed Forces responsible for providing power projection from the sea, using the mobility of the U.S. Navy to rapidly deliver combined-arms task forces. The US Marine Corps is one of the four branches in the US Department of Defense as a member of the Joint Chiefs of Staff. It is one of the seven uniformed services of the United States. As a veteran of the US Marine Corps (1984-1995, “honorably discharged”), I’ve always found the obligatory “thank you for your service” remarks somewhat grating. It’s difficult to explain why, but a Google News search returning 19.1 million media results in the last 30 days on the dual terms “veterans” and “service” indicates a need for re-examination of the whole concept of “service” as it relates to military affiliations. What is “service?” When someone signs a contract and joins a state’s uniformed armed force, who is serving whom? The answer isn’t as simple as one might think. “Service” is a layered thing in even its simplest forms. For example, think of the “servers” at your favorite restaurant. They serve at least two masters: The restaurant’s owners on one hand, you on the other. The market justification for this is that by serving the customers well (satisfying their desire for food served quickly, efficiently and courteously), the servers also serve the ownership well (satisfying their desire for maximum profits). And there’s no question that service is what they’re engaged in. They really are servants, not masters, at the beck and call of (and subject to pleasure or displeasure of) customer and restaurateur alike. Military “service” is different. The soldier, sailor, airman or Marine certainly serves the military force. Likewise, that military force certainly serves the state which created and operates it. But those are both instances of service to ownership. There are no “customers” in any real sense. The alleged “customers” — the tax-paying citizens of the state in question — are themselves servants rather than served. In the case of the United States, the only war in its 240-year history which even came close to qualifying as an instance of “service” to the taxpayers was the American Revolution. Every subsequent conflict, from the Whiskey Rebellion to the (just now supposedly wrapping up) occupation of Afghanistan, has been fought entirely in the interests of the state and the ruling class. To the extent that I’ve studied history, this appears to be true of all other states and their wars as well. If anyone should be thanking anyone else for “service,” it should be me thanking all of you who paid my salary, bought my food, provided my medical care, subsidized my travel and covered the costs of numerous other benefits of military “service,” even though nothing I did during that “service” could plausibly be construed as having been done in your defense or for your freedom. It’s unseemly that the direction of appreciation should be reversed, with you continuing to believe I did something for you. And since you really have little choice in the matter (other state “servants” stand ready punish you if you don’t pay for said “services”), it seems to me that what you’re due from me is not thanks, but sincere apology. I’m sorry I took the money that the state took from you. By way of restitution, I hope to help you abolish the state which took it.